This weekend starts the month of October, and that means it's time to start thinking about Halloween. 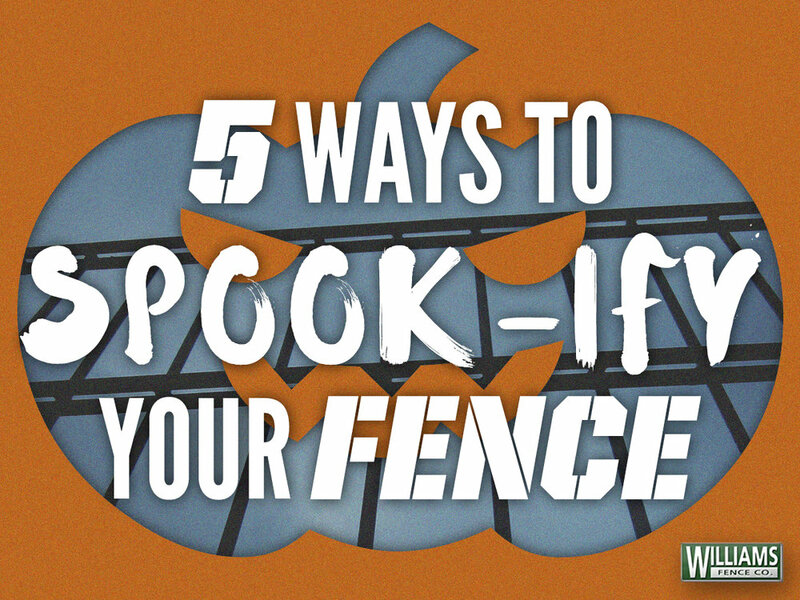 Decorating your house and yard to create a spooky environment for tricker treaters is fun for everyone, but this year incorporate your fence into your decorations! 1. Figures -- The fastest, easiest way to decorate is by simply hanging iconic Halloween figures from your fence rails. Bats, rats, ghosts, Frankensteins, scary clowns, or skeletons swaying in the chilly autumn breeze will create instant atmosphere for October 31. Make them pop by applying luminous craft paint -- if you dare -- and attach them to your fencing with sturdy finishing line, which is well-nigh invisible under the night sky. 2. Lights -- String your fence with rows of fairy lights emblazoned with jack-o-lanterns or black cats on an orange background -- tres Halloween. Or substitute eerie black light to show off your fluorescent decorations. Artfully placed candles and lanterns will exaggerate the spooky effect even more, but stick to fire-safe battery-operated or LED versions of these lights for your fence ornaments -- your goal is to make Halloween frightening in a good way. 3.Wreaths -- Normally seen as a homey symbol of hospitality, horrid Halloween wreaths strung up on your fencing say "Welcome to my nightmare" instead. Craft them out of wire, spiky twigs, or dead flowers and then adorn with any or all of the following grab bag of goodies: rubber spiders, ravens, witches' hats, oversized googly eyes, papier-mache bones, faux fangs, and shrunken heads -- the petrifying possibilities are almost endless. 4.Chains -- Add the finishing touch to your fence cover up with inexpensive but very effective plastic chains (purchasable by the yard), in shivery shades of black, metallic, or rust -- coordinating handcuffs or leg shackles are optional. 5.Signs -- Signs with meaningful messages are very trendy throughout the home right now, so why should your Halloween fence be left out? Create signposts that point the way to the cemetery or haunted house, and warn potential guests to beware and enter at their own risk. Our personal favorite sign sayings are "Keep calm and scary on," "Happy Halloween," or a straightforward "Boo!" Have fun making things scary and fun this Halloween!